We continue our college series and today we'll be sharing how your college student can budget, with the help of HP and we also share a very cool back to school project, our very own DIY Tie-Dye Canvas Shoes, which also helps with budgeting. If you want to read the others in the series, click on the label college on the bottom of this post and you will be able to read it all. The joys of being a college student, you are an adult now and time flies by so quickly. All of a sudden you have a huge appreciation for all that your parents provided to you, because today you are the one in charge of finances. If you had parents who were super good with money, then you probably will have no problems, learning how to budget in college, but if you are like most young adults, this whole learning how to budget money is a skill you have yet to master. 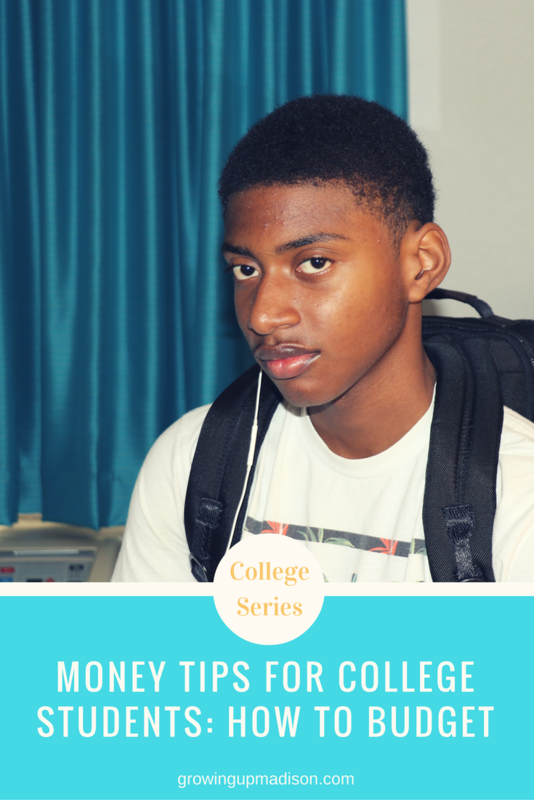 Today we will share some money tips for college students so that you can learn how to budget those funds wisely. Make a list of all that you need and want each week or day. There is such a thing as daily needs; food and drink are among those daily needs. Be realistic in what you classify as a want versus a need. This is the part where you will learn some self-constraint. A bottle of soda every day may not be a need; rather a preference. A preference can be listed as a want. Sit down to take the time to create a list of needs versus wants and remove all wants from your budget. Sit down to create a budget spreadsheet, have columns set up for dates or week 1, 2,3,4 so that you know how much you need to allot in finances towards needs each week. On the left hand side list out your monthly bills and daily needs. Consider rent, gasoline, college supplies, food and other consistent bills you may have on a regular basis. Calculate each bill down to a weekly number, match weeks 1, 2, 3 and 4 with that total. If you get paid bi-weekly or monthly, adjust the week columns appropriately. Stand firm with this budget spreadsheet, use it as your guide to financial survival while in college. When you work to manage your money and learn how to budget while away at college, you will have a lot of instances where trial and error come into play. You will want to maintain realistic expectations about your spending habits as a means to ensure you stick to and manage your finances appropriately. This means you must take into consideration miscellaneous expenditures that come up as well as some leisure time money. You deserve to plan in some entertainment with your college budget too, just do so sparingly and realistically. Whether it is food or textbooks, there are many websites set up to help you save on the cost of college supplies. Start researching where you can get the most for your money, this will free up some extra cash in your budget spreadsheet for some wants too. Look for online promo codes and sales sites geared strictly towards helping college students save money. Think about investing in a tablet so that you are able to use online textbooks, these are by far cheaper than textbooks at the campus store. Learn to shop smart for college supplies to stretch your college money the farthest. Another necessity is a laptop that you will need to do your college work. Since most college students don't have a ton of money, you want something that is not only economical but dependable and has the features that you will need. 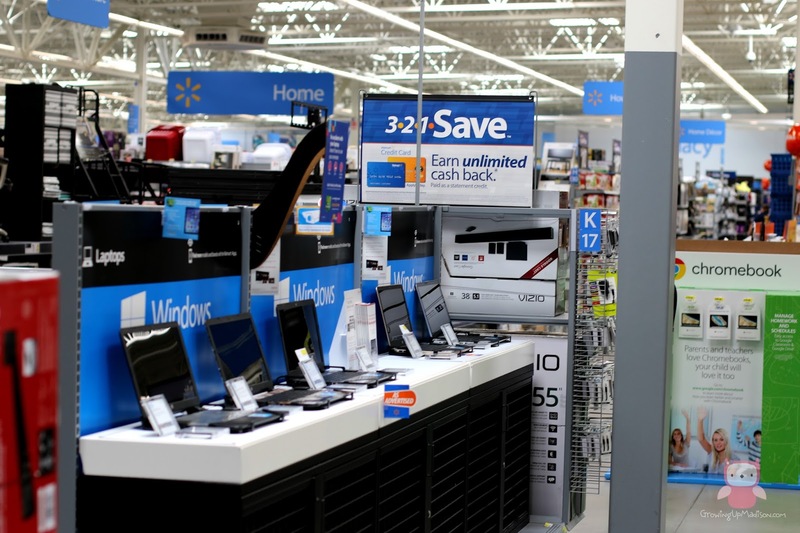 I recommend getting an HP laptop computer which you can find easily at Walmart in their electronic computer department. These NEW computers enable you to do so much more and best of all they are affordable. My son and I went looking and he fell in love with the HP 15-ay041wm. This comes with a 15" HD screen that has a really vibrant display that will allow him to view his photos, videos and web pages in vivid detail. With a 1TB of hard drive space and the latest Intel Processor, I feel secure knowing that he has enough memory to multi-task and store his work, and I won't have to buy him another computer in a year, because HP stands for quality. After all they've done over 200 tests to make sure that his computer passed their quality performance standards. What more can a mom ask for? Another way to budget is to make your own stuff as I like to say. We recently saw some really cool sneakers, but they cost an exorbitant amount so Madison and I recently decided to make our own. Not only will be a great gift for all back to school students, but you're also still budgeting. I remember growing up, I would write on my canvas sneakers as I'm sure most parents have done in the past. This can also be a bonding time for you and your back to school student. This project is inexpensive and doesn't take a very long time either, just three simple steps, so go for it! Here is what you'll need. 1. 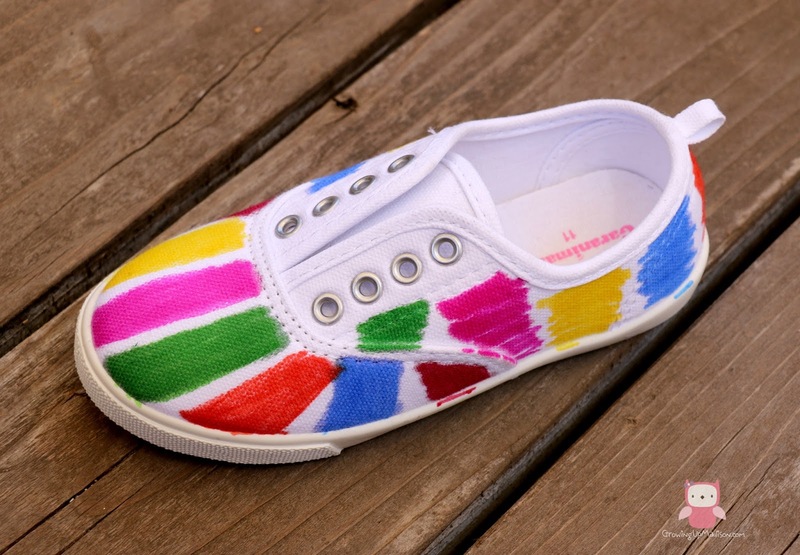 Start off by designing your canvas shoes with your markers. You can do it whichever way you want. Madison and I made them into big blocks of color as shown below. 2. Using a dropper add some of the alcohol onto the color of your shoe allowing it to blend into the other. I found that using the dropper took too long, so I decided to just pour the alcohol onto the shoe and that worked out great for us! 3. Place your shoe to dry, which takes about an hour, or less depending on the weather outdoors. Now you have your own too cool for school sneakers that you didn't spend a ton of money on, that is unique and one of a kind and you also have your HP computer that didn't break the bank. You've got your budgeting skills on fleek! If you like your HP computer like my family does, be sure to visit Walmart to share your thoughts! Encourage other families to shop smart this back to school season with your online review. My boys a re few years from College but their is so much to think about when they get closer. I love how you jazzed up these shoes to save money! Thank you Kara. Now is the time to start thinking about it. College is expensive and even you may have to start budgeting yourself too. What a fantastic idea for new sneakers. I really must try this out with my own kids. Great tips on saving money. Thank you and you should. It'll be a great bonding time for both of you. Have you started your back to school shopping yet? I'm beyond impressed with how those sneakers came out! The color blending is amazing. Thanks Monica. No two sneaker is alike so even if you do yours it'll look different. These tips are so helpful! Creating a budget spreadsheet and separating needs and wants are great ideas! 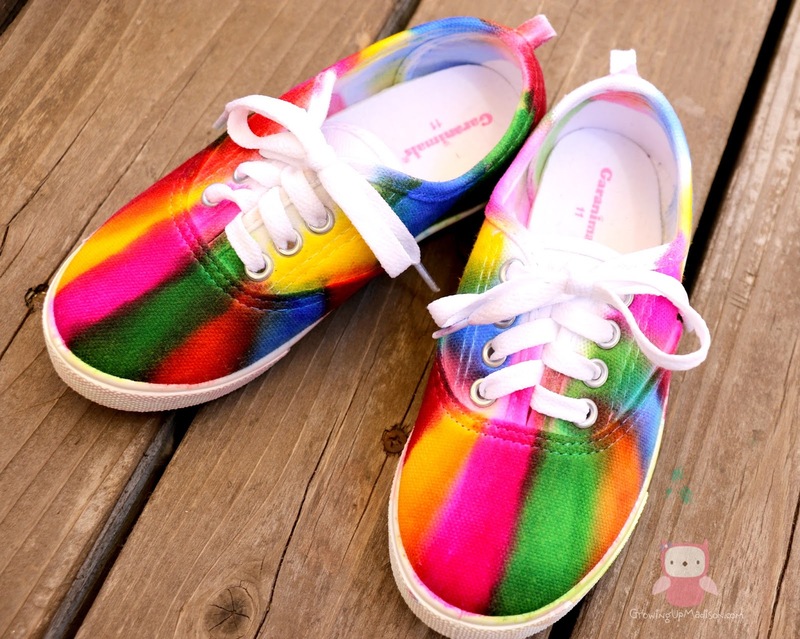 And that DIY tie dyed shoes are so cute! Will try that too! It's so difficult recognizing your wants/needs at time and the better you get at recognizing it, the better it will be for you. 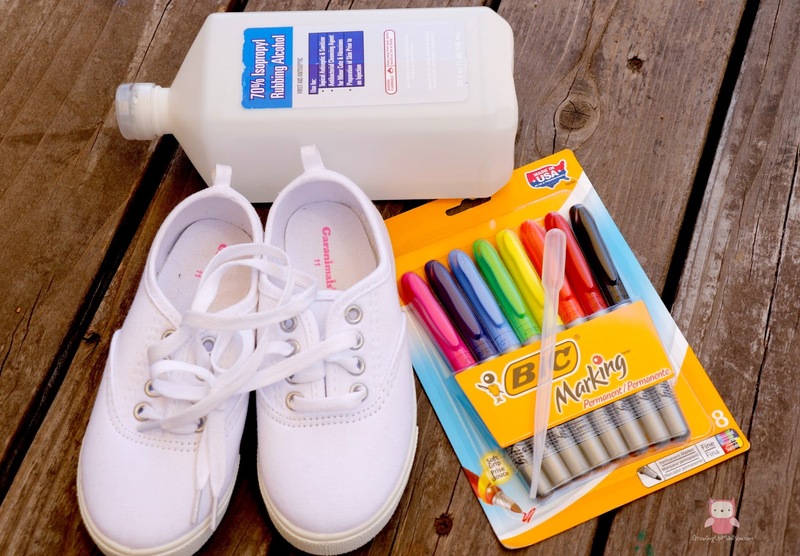 Cute idea for shoes and great tips for budgeting for college. I know that college kids aren't thinking of money necessarily, but they should. A former student ending up 62,000 in debt after college. Oh my goodness! That's a lot of money! 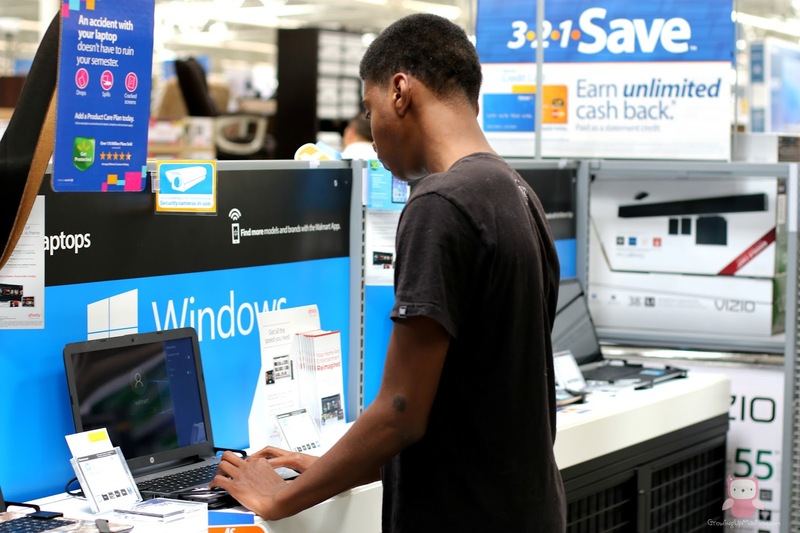 College students tend to think that they need the best of everything and will spends thousands of dollars on a computer when a more affordable version like an HP computer could have done the same thing. Those shoes turned out really neat. It is so important to have a good idea about budgeting before heading off to college. Yes it is and if you're not good at budgeting you may find yourself in more debt than you ever thought you'd be in. Totally agree re: a budget spreadsheet. We also use MINT. It makes it super easy to stay on track. How about doing 2, 1 for you and 1 for your college student. Share the love! These are great tips and those shoes are cute. We have been helping our 19 year old put together a budget. That's awesome! I did the same for my 20yr old and my son will be in college in the next 2 years so I've started with him as well. Have fun! It's so super easy to do, you'll wonder why you never did it before! HP Computers are AWESOME! When I was in college, my first laptop was actually an HP computer and it took me right through my 4yrs. My husband owns an HP touchscreen that he swears by and he wouldn't recommend anything else either. Ummm those shoes are awesome and I know my daighter would love to make a pair for herself! Walmart always has everything you need for back to school time! Don't they?! Walmart has EVERYTHING you need, not just for back to school but for our craft too! If you're looking for a computer for your own child for back to school, we would definitely recommend an HP. Those tie-dye shoes are so cute! Will they hold up in rain? Hi Colleen, they actually do! Since they were done with permanent markers they hold up very well. If you're worried you can always use mod-podge to cover them. Those sneakers are ADORABLE and bright and fun - and such a great way to get involved and save money! The budgeting tips would be amazing for anyone going to college or who needs to improve their spending habits! Budgeting tips can help anyone, especially if you're not good with money and thanks for the compliment about the shoes. It is a great way to get involved with your child. Wow, this is such a needed post right now. Teaching a college student to budget is so hard! I love those shoes too! What a great way to make them your own. You can say that again. I have a college student who thinks that word doesn't exist in her vocabulary. Oh my word. These shoes are all sorts of amazing! My girls would love this so much. Thank you Debra. We had a fun time making them. These are some really important things to consider before sending the kids off to college. It's nice to have some cash left over for unexpected expenses. Oh yes it sure is and you know we can do so much with left over cash. If you purchase an HP you'll have so much more left over too! 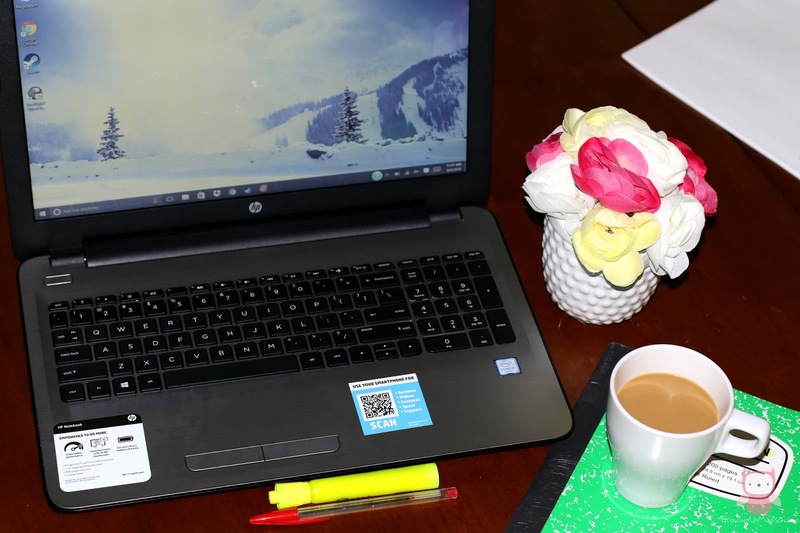 Budgeting is such an important life skill to have and I love the idea of a spreadsheet. I will definitely be making those awesome shoes with my daughters sometime soon, including a pair for myself! Spreadsheets can work with anyone/anything including even with your household. You should show us your pair when you're done. I love the shoes! Such a great idea to give life to shoes. I will have to try this with my kids. Give them a try and share your creation with us. I need to show my niece these college money saving tips! And these cute shoes! She loves making stuff like this. Maybe you can make the together with her and don't forget to tell her to save some money buying an HP computer. I totally saw these tie dye shoes on my Facebook feed and loved it! Looks like such fun to make! Those shoes are AWESOME!! And I love my HP computer...it's the only brand we buy. That's awesome Stef! You sure know how to choose the best! The shoes are awesome. I recently saw about printing photos on canvas shoes. 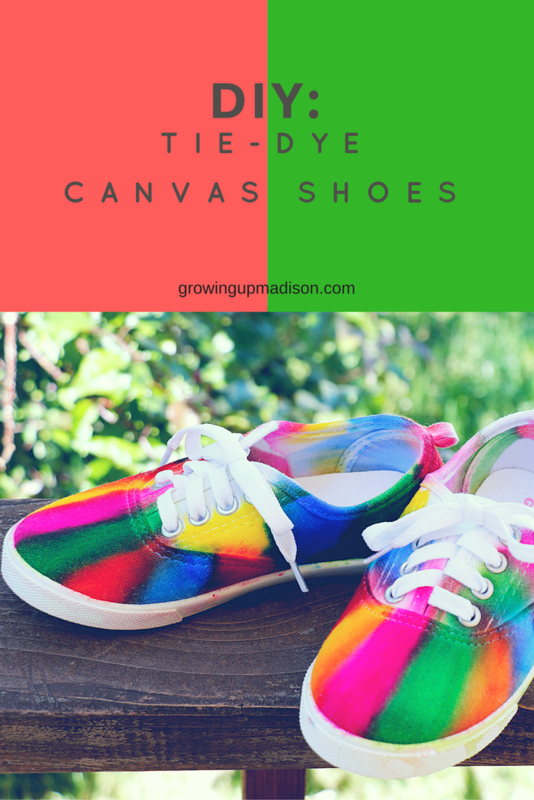 No doubt, canvas shoes rock and you know I love colors and tie-dye. College was so different when I went over a decade ago! I absolutely love those shoes! Budgeting is a really important skill to learn as you get older! Budgeting really is and the older you get the better you should start becoming. Love the sneakers! MY daughter would love to do that! These are wonderful tips! I love the tie dye shoes as well. They turned out great! Thank you Felicia and thanks for stopping by. Those shoes are epic love the rainbow DIY hack. As for saving and shopping smart, your budget like you said is trial and error but that is ok! Thank you Ana and when shopping you always should shop smart, that's how you end up saving. I have sneakers that I wanted so much to give a new look, so I will use your smart idea for the sneaker. The budgeting tips are helpful guideline for students tp control/manage their finances, but I think the tips are also useful for anyone else. Yes they are most certainly useful for everyone! You can always give your sneakers a new makeover with our DIY. Give it a try. I've got on out of college, one in college and 10 year old twins, so saving money is something we're super focused on! I love these shoes and I bet my youngest daughter would to. Maybe we'll make the this week! College is so far yet so close! These are great tips for what to do to make sure that you get the most from the experience and stick to a budget. That is true and you should try to make the most of your experience. Oh my gosh, my daughter would love those tie dye shoes! How fun are those?! They are very fun and good to hear that your daughter would love them. Thanks for stopping by. I am in love with those tie dye shoes. I want to make some for both of my girls! Those canvas shoes are awesome! Thanks for sharing your helpful tips! On my end, now that our kid is older we are trying to help her understand how to budget. It's never too early or too late to start teaching them how to budget. It'll really pay off in the long run. What a fantastic idea. And I know my kids would wear them because they made them all by themselves! That's the great thing about DIY. Since they made them themselves, they tend to cherish them more. I love how the shoes turned out. I will have to try this on my white canvas shoes I have. My Daughter is looking for a laptop to take to University. We will have to check this one out. You can't go wrong with HP and guess what? You'll be saving some money too. It's so true! When I was planning to go to college, all those expenses started flooding in and I was stunned. Oh the cost of college and add up and quickly that's why you need to budget and start saving. These are awesome budgeting tips. I actually got my first HP laptop when I went to college. Thank you and my first laptop in college was an HP too. I actually had a choice between Dell and HP and my brother got me the HP. Lasted right through college! 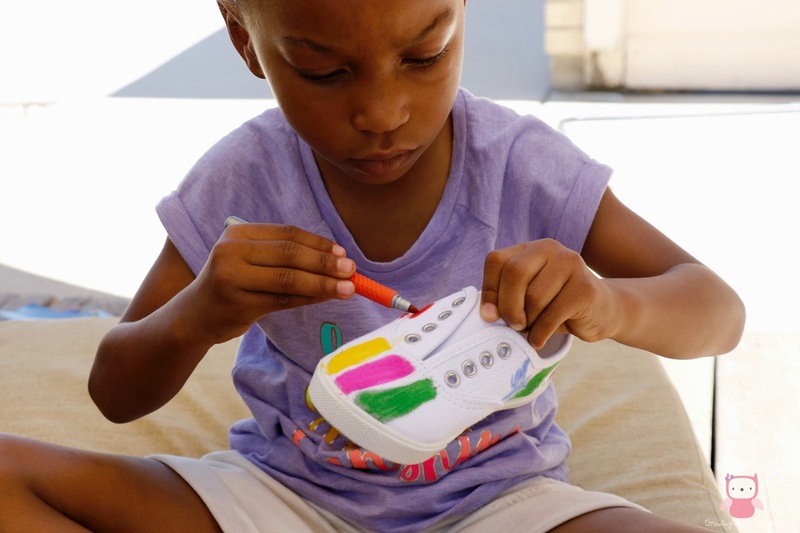 My Mini Me would love this shoe project! When she gets home from summer camp, I'm going to show her this so she can make a pair of these. Such a simple idea and so many ways to be creative with it! I'm sure you'll both have fun doing it together! I like the sneakers idea! That is a real hack, very brilliant. Thank you Nicole, it really was super easy. I like DIY ideas especially for back to school. The sneakers look so great! Thanks Nikki and I'm all up for doing things the easy way. I'm a university student and agree that spreadsheets and shopping smart is a must. A great way to save money is to give yourself a weekly budget. That's really another great way too. If you can't do a monthly budget, doing it weekly will help. Good tips. Sticking through college's easier these days, most of them can just surf the internet when during my time, excessive spending was a headache with all the gimmicks here and there. And who would've thought I'd see an awesome DIY craft for shoes here! It does seem like it's gotten easier these days for college students but they're also spending a whole lot more. Being a college student can be a little scary. Having a budget that you can sustain is a really great idea. It really helps to relieve some of the stress. Classes are going to be stress enough, so worrying about money is just another burden that you don't need. It truly isn't. If you're stressed out about classes etc, then being stressed about money is only going to burden you more. Budgeting will help. I work with college students and I will be sharing your tipps. The textbook game is a fierce one that they need to learn to master early! Oh tell me about it! My daughter recently paid almost $300 for a college text book. It's truly ridiculous. Girly girls would totally love this. At the age of 4, that's when you can get them to do so much with you too. Enjoy! Thank you. I appreciate the pin! I am in love with those shoes! So cute, and easy to make. Thank you Stacey and yes they are very easy to make.